Posted on January 21, 2013 by Jen Bearden	• This entry was posted in Classroom, Math and tagged ActivActivity, geometry, groups, math, math workshop. Bookmark the permalink. A quadrilateral is any shape with four sides. A parallelogram is a shape the has two sets of parallel lines. A rectangle has four right angles. A rhombus is a quadrilateral and a parallelogram. A square is a parallelogram, equilateral, rectangle, rhombus, and it has four right angles. –Seamus, Zoe, Sophia, Rebekah, Jernandra. A polygon is a shape with straight sides, closed sides, and no intersecting lines. So we could call all of these shapes polygons. A quadrilateral is a shape with 4 sides. So (for example) a square is a quadrilateral. A parallelogram has 2 pairs of parallel sides, for example, a rhombus. A quadrilateral is a shape with 4 sides. 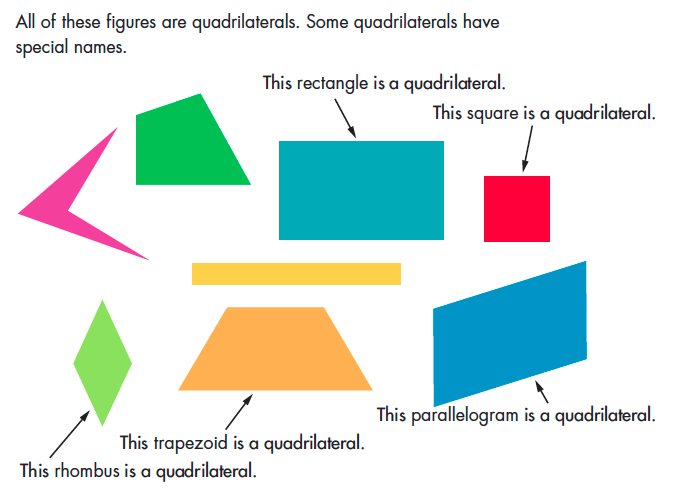 For example a rectangle,trapezoid,rhombus, and squares are all quadrilaterals. A square has 1 right angle at each corner. A rhombus is a quadrilateral. It’s also a parallelogram because it has 2 pairs of parallel sides. A trapezoid is a quadrilateral, but NOT a parallelogram because it only has 1 set of parallel sides. Square is a quadrilateral, rhombus, rectangle, and a parallelogram. Rosie, Don, Jack, and Anna K.
A quadrilateral is any shape with four straight sides.A parallelogram has 2 sets of parallel lines but it is also a quadrilateral.A quadrilateral has 4 angles too.A quadrilateral has no intersections also.